A Simple Way to Make a Big Impact. Lighting has the ability to make a big impact in two ways: the fixture itself is a design element, and also the light that it casts can greatly affect the look and feel of a room. Best of all, because changing a light fixture is a relatively quick and simple project, you can dramatically transform your space in no time. At The Door Store, we have a large collection of antique lighting, from elaborate oversized crystal and wrought iron chandeliers to traditional wall sconces and streamlined industrial fixtures. Brilliant and dramatic, crystal chandeliers are a classic choice that will never go out of style. Toronto’s top designers have been coming to us for years as their source for these luxe fixtures that look great in any décor. While our oversized chandeliers are a natural for dining rooms and front hallways, we also carry smaller, more delicate pieces that look lovely in powder rooms, bedrooms, or anywhere that needs a dash of sparkle. 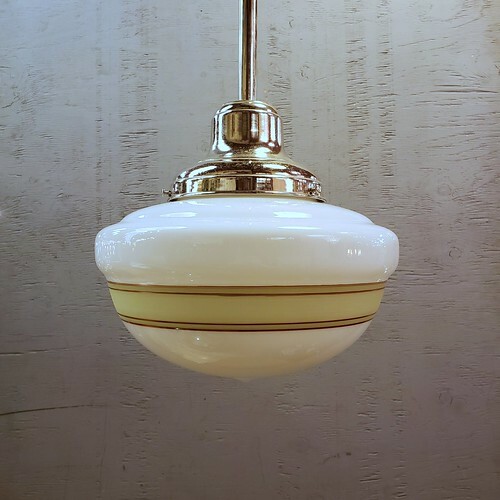 Schoolhouse lights, with their creamy milk-glass shades, were ubiquitous in institutional buildings like libraries, courthouses, hospitals, and of course schools from the 1920s straight through to the 60s. Because they spanned such a vast era, they were made in a countless number of styles, from the iconic traditional shades to some stunning deco designs. They’re now a favourite in home kitchens and hallways as well as restaurants and loft spaces. 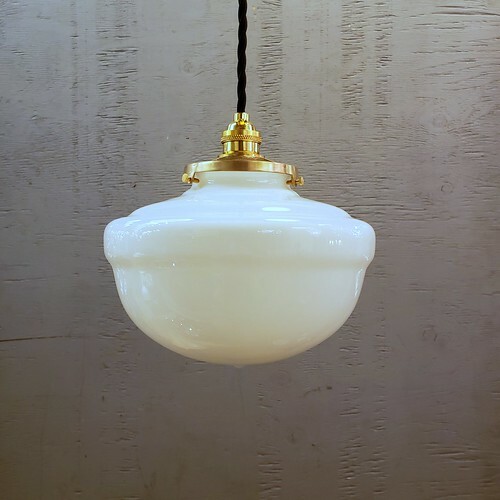 We always have a great selection of schoolhouse lights in tons of sizes, styles and finishes. 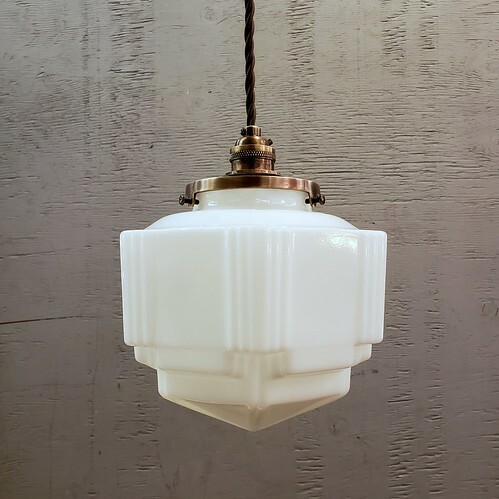 In the last few years we’ve sold hundreds of fixtures salvaged from old warehouses and factories. 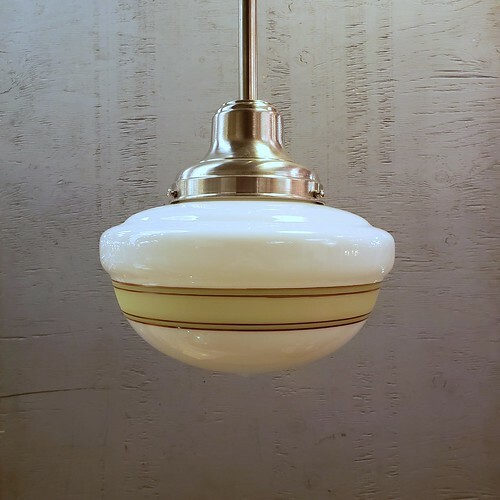 Fixtures like corrugated glass and brushed steel Holophanes or explosion-proof lights with green or white enamel shades that were salvaged from an old paint factory. 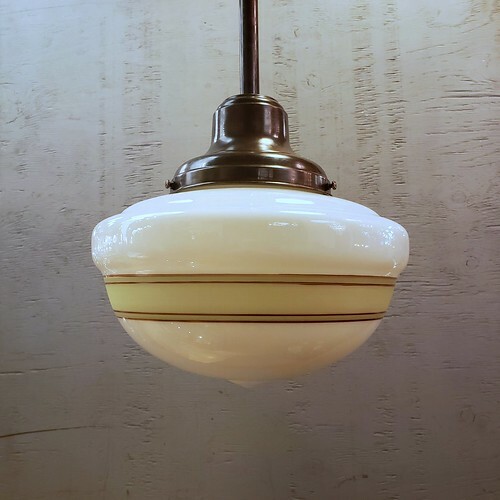 Sleek, sturdy, and unabashedly utilitarian, these lights have been snatched up for use in kitchens, loft spaces, restaurants and night clubs – anywhere that’s calling for a departure from traditional residential lighting. 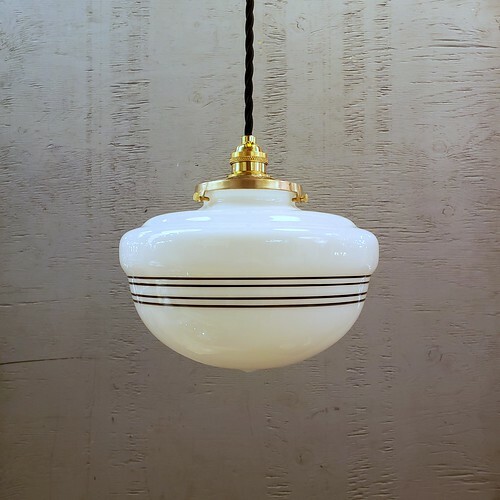 We love these sleek, simple lamps that use our antique tiles for bases. Beautifully-patterned floor tiles are a hallmark of North Africa and the Middle East. Culled from flea markets in Cairo, these well-worn concrete tiles are given new life with a modern shade, but still they remind us of sipping sweet mint tea in a bustling bazaar. How do you know what size fixture will fit? The two main spaces that seem to cause the most concern are hallways and dining rooms. For hallways, the rule-of-thumb is that you must leave 7 feet of clearance below the fixture – the height of your ceilings will help you to determine whether you can fit a large chandelier, a small pendant or a flush mount light. For the dining room, the diameter of the fixture should be about 12 inches narrower than the width of your table, and the bottom of the chandelier should be approximately 30 inches above the table. For other rooms, some people use a simple calculation as a guide: for example, if your room is 12′ x 14′, you would add these measurements together to get 26. This number, in inches, is the approximate diameter of the fixture that that will look proportionate in your room (in this case, 26 inches).